Route A1 is main cycle route in Prague. 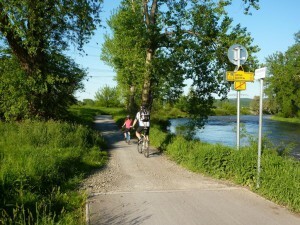 It runs along the left bank of the Vltava river from south to north (route on the right bank is A2). The length of the route is 26 kilometers. The route starts in Radotín in the south of Prague and ends in the north of the town near the ferry in Sedlec. In the city center and in Holešovice the route is not marked. On the outskirts it leads mostly on separate bicycle paths, in the city center on the roads.